Plenary Session "The Peace History Society: A History and Analysis by Some of Its Early Leaders" at 2007 PHS Conference "Historical Perspectives on Engendering War, Peace and Justice"
The Peace History Society was founded in 1964 to encourage, and coordinate national and international scholarly work to explore and articulate the conditions and causes of peace and war, and to communicate the findings of scholarly work to the public. 2019 PHS Conference: Commemorating Violent Conflict: Building Sustainable Peace (Kent State University, October 24-26, 2019). The Call for Papers deadline is February 15. The January 2019 PHS Newsletter is now available. 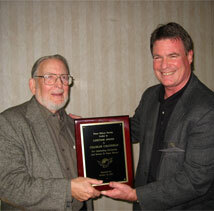 Charles Chatfield receives the 2007 Lifetime Achievement Award from PHS president Scott Bennett. Charles F. Howlett, "American Peace History since the Vietnam War," Perspectives on History (December 2010): 35-38. Join our Facebook group and visit the Peace & Change blog!